This folding stool is easier to carry than a clunky folding chair and it takes up less storage space too! 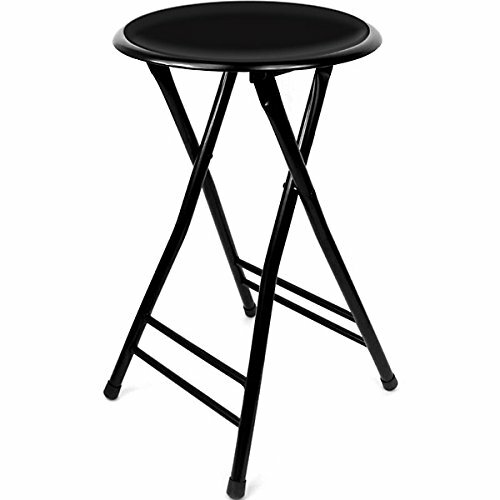 These stools are perfect for accommodating additional people at your parties, meetings and events. The best part is, they're actually comfortable to sit in! What more could you ask for in portable, collapsible seating? * Specs - Opened Dimensions: 14"W x 24"H x 15"D, Folded Dimensions: 13 1/2"W x 35 1/2"H x 2 1/2"D, and Padded Seat Dimensions: 14 1/8" Diameter. An inexpensive way to add extra seating. Opened Dimensions: 14"W x 24"H x 15"D.
Folded Dimensions: 13 1/2"W x 35 1/2"H x 2 1/2"D.
Padded Seat Dimensions: 14 1/8" Diameter.